This town ain't big enough for all these cybernetic enhancements. Deck13's The Surge has a new expansion available now, and it's quite the interesting one. The DLC offers a cool Western makeover for the game's cyberpunk aesthetic already in place, changing things up significantly. 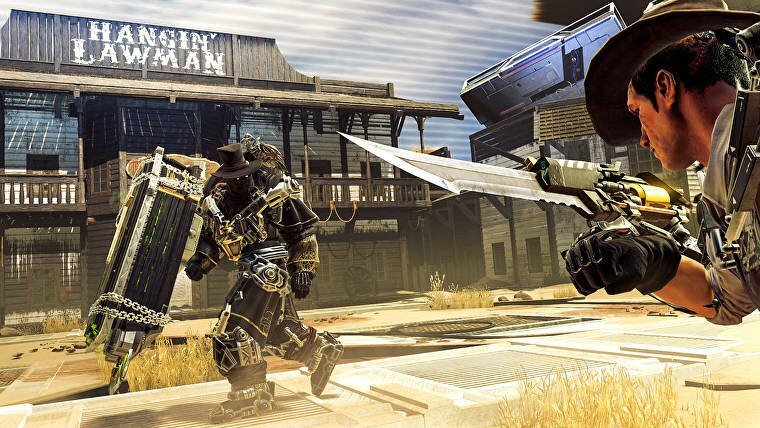 The expansion is seriously dripping with the attitude of a gunslinger, and it's totally worth checking out, especially if you were a fan of the original game. Check out the trailer for The Good, The Bad, and The Augmented, which shows off more of The Surge's Dark Souls-esque combat and challenging encounters. They're even more austere than they look to have been before, with new enemies, and 16 new modifiers, four of which can be enabled simultaneously. You can even play through the game with a special sepia silent movie style with flickering film effects and no audio aside from piano music. Weird, and awesome. The expansion is out now for $9.99, and you need the base game if you want to check it out. Do you think you're going to give it a go? Let us know in the comments below! Neat, I'm surprised this game is getting so much post release support as it seemed to fly under the radar a bit.